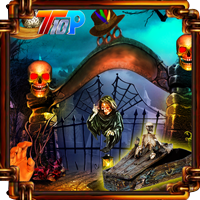 Top10 Find The Coffin Box is another point & click escape game developed by Top10NewGames. Assume that a coffin was hidden at a horror place. Now you are going to retrieve it by using a key, objects, hints and by solving puzzles. We hope you will find that coffin. Good luck and have fun! Sneaky stick in scene 2, sneaky spot by an elbow, sneaky letter on a tree.